I find it easier to think in images or graphics, it helps me see how things or topics relate to each other. Mind maps are great but at times I want a single image to show just a few things together. Triangles are easy, three things are related but still separate. Below are two other diagrams that help me sort things out. A friend mentioned Venn-diagrams. I have seen them before but was not familiar with the name. It’s a great way to show how things relate to each other and that they overlap. 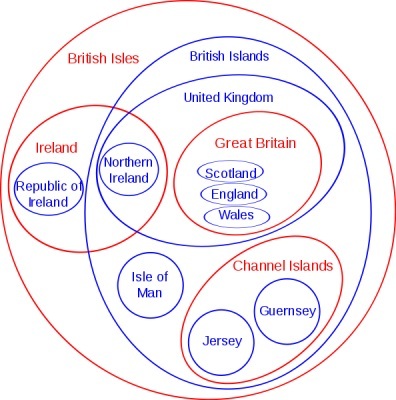 Venn diagrams normally comprise overlapping circles. The interior of the circle symbolically represents the elements of the set, while the exterior represents elements which are not members of the set. For instance, in a two-set Venn diagram, one circle may represent the group of all wooden objects, while another circle may represent the set of all tables. The overlapping area or intersection would then represent the set of all wooden tables. Euler diagrams are useful in other contexts. The quote below comes from Wikipedia, Euler diagram. The image below that quote is a great example that includes sets, subsets, intersections and disjointness. Euler diagrams consist of simple closed curves (usually circles) in the plane that depict sets. The sizes or shapes of the curves are not important, the significance of the diagram is in how they overlap. The spatial relationships between the regions bounded by each curve (overlap, containment or neither) corresponds to set-theoretic relationships (intersection, subset and disjointness). Each Euler curve divides the plane into two regions or “zones”: the interior, which symbolically represents the elements of the set, and the exterior, which represents all elements that are not members of the set. Curves whose interior zones do not intersect represent disjoint sets. Two curves whose interior zones intersect represent sets that have common elements; the zone inside both curves represents the set of elements common to both sets (the intersection of the sets). A curve that is contained completely within the interior zone of another represents a subset of it.